How often do you say ‘I love you’ to your children? Do you even say it? ‘Can he even understand it when he is just 3 months old?’ She asked me. ‘If he doesn’t understand, it is okay. I do.’ I answered. Of course, you love your child like nothing else in this world. Your baby will become the most treasured part of your world, your life from the moment he or she arrives. Everything you do, you do it keeping the little one’s well being in mind. You know in your heart that you will do almost everything for your child. You know that you love your child with a possessiveness, with loyalty that never wavers. But… does your child know it? How often do you say that you love him, through little actions, in words? Like this friend who asked me why I say ‘I love you’ to him when he doesn’t understand, most of us never say I love you…’What is the use?, we argue. Love…a love stronger than all, connects you to your little boy or girl, even after the umbilical cord is severed. That is why (s)he recognizes your heartbeat, your sound, your touch. So what is the proof that (s)he doesn’t understand your words? Such love, a love that is beyond any words, that transcends everything…it must be shown, shared. Isn’t it? From the first moment I knew that I have a little life inside me, I started to say I love you. Started to sing, and share stories of my life with him, even when he was just an embryo. Everyone said that he would not even hear me talk…but I had this unshakable trust that the baby would feel my love. Would feel that his mumma loved him without knowing who he will be, what he will be. How could he not…when love flowed like a thrashing river inside me? And then when he became a fetus, I’d tell him how much he/she means to me. When he got older inside my womb, I could sense it…His little bumps, his kicks when I talked to him at night, when everything was silent around us. It felt like he was saying that he heard me, that he loves me too. It must be a stupid belief, but…I still continued it. After he was born, I continued to propose my love, almost always, mostly when I massage him with his oil or lotion. The contact would make him feel connected with me, the touch would make him feel safe and protected. He always laughs or smiles so much when I tickle him, or touch him, kiss him. He has a smile reserved for me, when I am near him, when he hears me. Love you…such an easy word. Maybe he won’t understand it…it is okay. He will feel it, feel my warmth, the adoration, when I whisper so softly to him. He will learn to recognize my touch, my words…learn to trust that I will not hurt him, that I will stand by him. And isn’t that love? Isn’t that what I want? The smile that he puts on only when he looks at you, isn’t it proof enough that he understands, that he recognizes you as the one who is his, who loves him? If you don’t say it, how will your child know? So if you have postponed it for a year, a decade, or more, it is okay. It is never too late to say ‘I Love You’, nor is it that difficult. 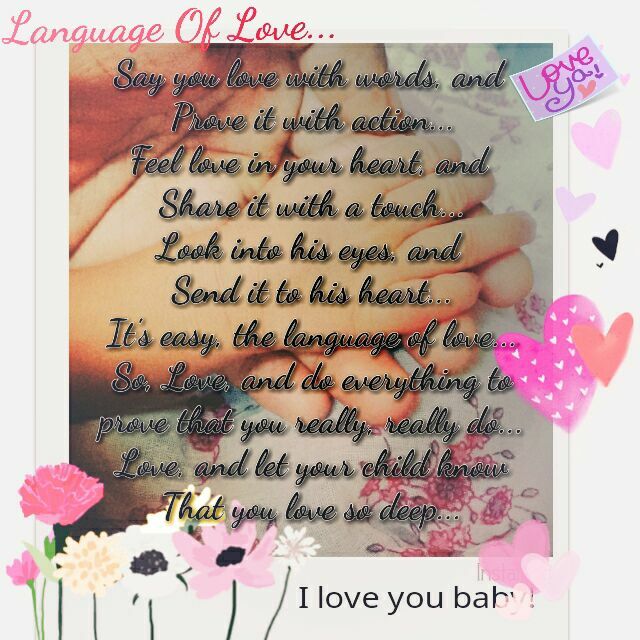 ‘I Love You…’ Now, go and say it out loud.